Wabakimi Provincial Park in Ontario, Canada is a beautiful nature oasis that’s great for all kinds of outdoor activities. Here at Mattice Lake Outfitters, our mini-lodge sits in the heart of the park, surrounded by 25 miles of flowing river. Never heard of Wabakimi Provincial Park before? Here’s everything you need to know. Wabakimi Provincial Park is a wilderness park located in the province of Ontario, Canada. The park contains a vast and interconnected network of more than 2,000 kilometers of lakes and rivers and covers an area of 8,920 square kilometers (3,440 sq mi). It is the second largest park in Ontario and one of the world’s largest boreal forest reserves. If you love outdoor activities, you’ll love spending time at the park. 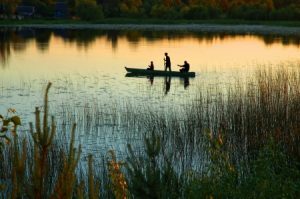 For fishing, the area is one of the best and legendary for ample walleye and northern pike catching opportunities. The park also offers world-class wilderness canoeing, including over 2,000 kilometers of lake and river routes and some excellent whitewater. For hunters, the remote wilderness surroundings are home to all kinds of wildlife, from deer to bears and more. History buffs also love visiting the park due to its long cultural history. The lands within and around Wabakimi are the traditional areas for several First Nation communities. Book your stay with us today and see the best of what Wabakimi Provincial Park has to offer! We make it a point to provide guests with all the features and amenities needed in addition to the supreme accommodations that make for an unforgettable adventure.